A last-minute goal saw South Africa's Ajax Cape Town lose 2-0 at home to visiting Sagrada from Angola, who win their Confederation Cup tie 3-2 overall. Arsenio Cabungula scored both goals for the Angolan side the all important second coming in the final minute of the match. Next up for Sagrada is a tie against Lusophone rivals Liga Muçulmana de Maputo from Mozambique. Earlier on Saturday Uganda's SC Villa beat Al Khartoum of Sudan 1-0 in Kampala in the second leg of their tie. Godfrey Lwesibawa scored the only goal of the game after 25 minutes to complete the 2-0 aggregate victory for the Ugandan side. Next up for SC Villa will be JKU from Zanzibar, who progreessed after the withdrawal of Gaborone United from Botswana. There was no fairy-tale for Senegalese second division club Generation Foot as they could only manage a 0-0 draw against visiting Nasarawa United of Nigeria. 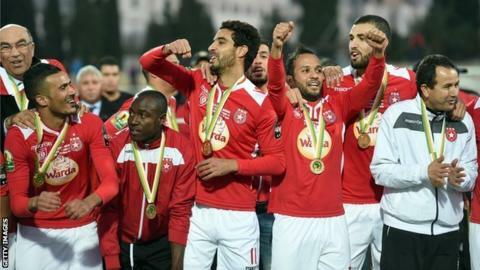 Generation Foot were the shock winners of their country's FA Cup last season but crashed out after a 2-1 loss to the Nigerian side in the first leg. Substitute Drissa Dagnogo scored twice for Africa Sports of Ivory Coast as they completed a second 2-1 win over Congo's Diables Noirs in Abidjan to make it 4-2 overall. Tsiba Moukassa, who also came on as replacement, was on target for the Congolese side between Dagnogo's strikes. South African side Bidvest Wits thrashed Lightstars of the Seychelles 6-0 to win 9-0 on aggregate. Sibusiso Vilakazi, Abednigo Mosiathlaga, Vincent Pule, Liam Jordan, Joaquim Lupeta and Dillon Sheppard all scored at the Bidvest Stadium. Algeria's Mouloudia Oran have progressed to the next stage of the competition after Wallidan from The Gambia pulled out. Esperance of Tunisia, ENPPI from Egypt, CS Don Bosco of DR Congo and Zambia's Zanaco have byes in the first round next month.